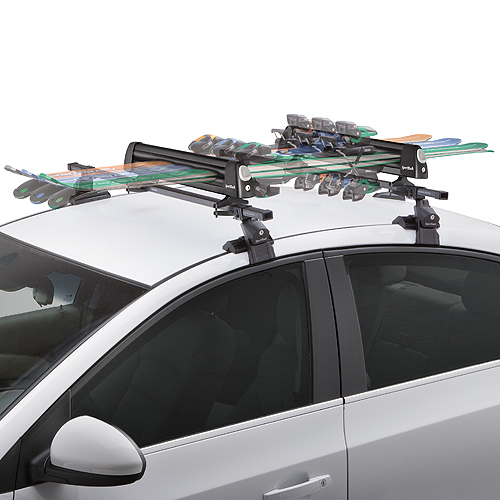 SportRack - Car Roof Rack Mounted Ski Racks and Snowboard Carriers hold up to 6 pair of skis or 4 snowboards. The most popular SportRack Ski Rack is the Groomer Deluxe. Groomer Deluxe sr6466 holds up to 6 pair of skis, 4 snowboards or a combination of the two. The Groomer Deluxe Universal Mounting Hardware adjusts to fit around most factory and aftermarket crossbars including Thule, Yakima, Inno, Rhino-Rack, Malone Crossbars. The Groomer Deluxe is designed with a large push button release for easy accessibility - even while wearing bulky gloves or mittens. Locks and Keys are included to secure your skis to the carrier and the carrier to your vehicle.